Hi, my name is Erik Jensen. I study at Umeå University to become teacher in p.e and math. Im from a little village in the west of Sweden, Högboda, which is famous for a writer, Bengt Bratt who wrote the TV- serie Hem till byn. In my spare time i love to sport, study and read novels! My name is Lina Frick, i study to be a pe-teacher at Umeå University. I´m born in Lycksele, which is a small town about 12 km from Umeå. When i´m not at school i really enjoy to do the most of sports and making music. Hi! I'm Jonathan Jonsson and I study on Umeå University in the north of Sweden to a P.E. teacher. On my spare time I'm playing soccer in a team in the Swedish 1-division. I'm born and raised in Umeå with my two brothers and sister. My name is Frank and i'm AWESOME. I don't like to use computers but now I try too do my best. I'm study physichal education in Umeå and looking forward to meet some wait for it, PEOPLE. This class going to be LEGEN... wait for it DARY !!!!!. My name is Sandra Lindé and I study to be a teacher at Umeå University i Sweden. I am bourn in Örnsköldsvik, a town 10 miles south of Umeå. In my spare time i like doing and watching sports of different kinds. My name is Jonas Lundberg and I study to be a teacher at the unversity in Umeå Sweden. I'm born in Skellefteå a town 130kilometers north of umeå in the north Sweden. In my sparetime I watch How i met your mother and barney stinson is A GOD! not in a gay kind of way way because I'm straight as an arrow but his caracter i just AWESOME! 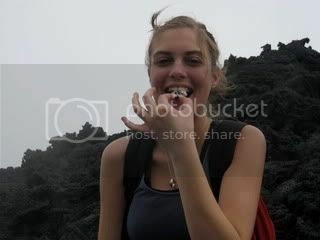 Last summer I went to Guatemala and we climbed a volcano. We roasted marshmallows on the lava! Hello!!! My name is Earl Emerick and I am a freshman at Purdue university, majoring in Social Studies Education. I am from Attica, Indiana a small town about 30 miles from the Purdue campus. I work at the Harrison Hills Golf and Country Club and love spending my entire summers at the golf course. My life revolves around sports. I collect ticket stubs from the variety of events that I have attended and this number is approaching 150. So if you ever want to find me, I am either at the golf course, Mackey Arena, or Ross Ade!! Have a great day!! Myself and one of my great friends Elizabeth on graduation day!!! Hey! My name is Courtney Bowman and I am a freshman at Purdue University studying Special and Elementary Education. I am from Barrington, Illinois. It's about 45 minutes from the city of Chicago. I absolutely love Chicago and hope to live downtown someday. I love hanging out with friends and family, exercising and playing sports, relaxing, shopping, and meeting new people. My sorority sister and I!